Electrical drawings and equipment are core elements of the electrical trade, and understanding them is essential for any aspiring electrician. This course will get you fully up-to-speed on these important topics. By the end of the course, you will know how to analyze information about power, lighting, and communication in the context of any engineering project, and you will be familiar important electrical symbols and test equipment. Interpreting electrical drawings accurately is one of the most important skills that a professional working in a related field can acquire. With this course, you will learn how to read drawings and become familiar with important terms associated with the drawings including the different electrical symbols, lines, and layouts. An electrical plan is one of the most critical blueprints of a project, so it is important that you learn to read this by heart. Next, you will learn about scale drawings, power plans, lighting floor plans, electrical details, and diagrams. The course will also cover the different electrical current testing instruments such as an ammeter and a galvanometer as well as discuss their uses. You will also get a clear understanding of how a moving-coil meter operates, the purposes of testing equipment such as a voltmeter, ohmmeter, and multimeter, and the difference between an analog and a digital voltmeter. Being able to read the wiring and cable connections is essential for proper electrical installation and maintenance. 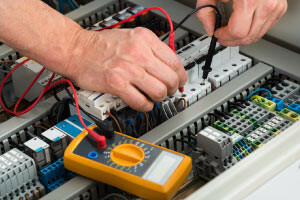 This Introduction to Basic Electrical Drawings and Test Equipment course will be of great interest to professionals in the areas of construction and electrical engineering, as well as learners who want to gain practical knowledge and understanding of the electrical trade. So why wait? In just a few short hours, your electrical skills, and your résumé, will be at the next level. List the plans and drawings that are included in electrical drawings. Describe the various terms associated with electrical drawings. Discuss the drawing layout, the common drafting lines, and the electrical symbols used in the trade. Explain what is meant by scale drawings, power plans, lighting floor plans, electrical details and diagrams. Describe electrical current testing instruments such as an ammeter and a galvanometer. Summarize how a moving-coil meter operates. Identify the purpose of testing equipment such as voltmeter, ohmmeter, multimeter. List the difference between an analog and a digital voltmeter. Simple and easy to understand beginning. it has helped me alot.